LSU had a really good recruiting season. There has to be a but added to any evaluation of the Tigers’ 2019 class. This class would have had just about everything if defensive tackle Ishmael Sopsher of Amite, La., had chosen the Tigers, which he nearly did. 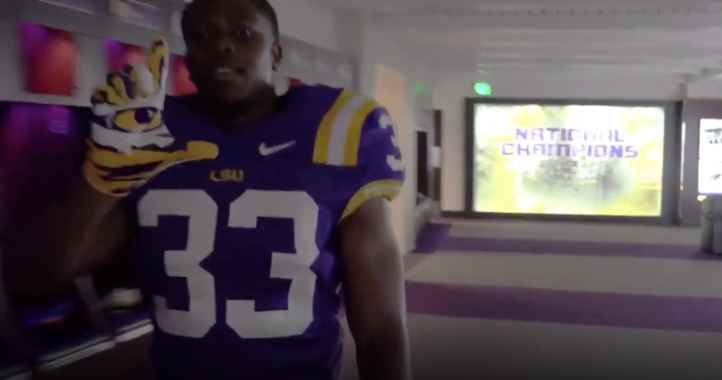 But shortly after noon Wednesday, just moments after a teammate – 4-star wide receiver Devonta Lee – put on an LSU cap, leaving the final scholarship in the nation’s No. 5-ranked class there for Sopsher’s taking. Sopsher added not his name, but a large “but” to the Tigers’ recruiting class. Sopsher chose Alabama, leaving Orgeron one defensive lineman short of the group he coveted, allowing one of Louisiana’s own – a mere 60 miles northeast of the LSU campus – to slip through his fingers. And, of course, choosing the Crimson Tide added insult to, well, insult. After Alabama beat LSU 29-0 last fall in Tiger Stadium, Orgeron bemoaned the Tigers’ eighth consecutive loss to the Tide by saying LSU had to get better on both lines of scrimmage if it was going to close the gap on Bama. When the Tigers signed 19 recruits in December, Orgeron said the biggest priority in February would be to add to the defensive line. LSU beefed up both lines in December and added to the defensive line in a meaningful way Wednesday. No single recruit is going to make or break any class, especially one who rates 4-stars and not 5. But Sopsher’s absence on the defensive line for the next few seasons is exacerbated not only by his presence on the Tide’s defensive line but also by the lost opportunity to beat Bama in this head-to-head recruiting battle. Landing Sopsher (6-3, 334) would have been an exclamation point, solidifying Orgeron’s best recruiting class and suggesting that this off-the-field victory in February might lead to an overdue on-the-field victory next November in Tuscaloosa. 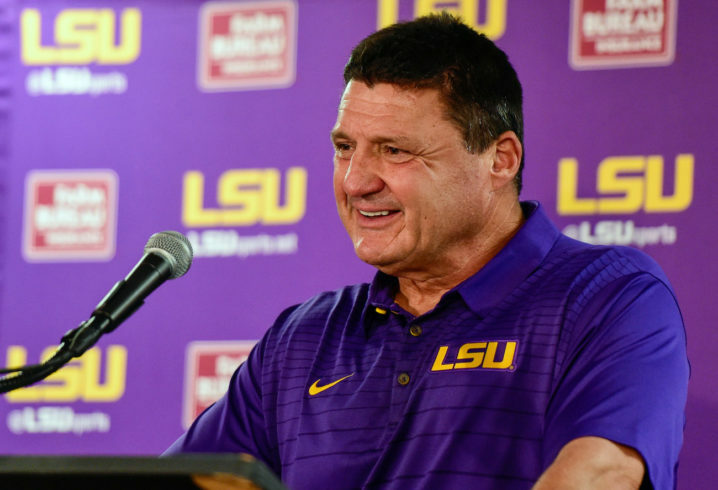 Maybe LSU will beat Alabama – soon if not in November – and there are reasons to believe this recruiting class has the Tigers on the right track. The Wednesday signing of 3-star JUCO edge rusher defensive lineman Soni Fonua (Mesa, Ariz.), the nation’s No. 6 JUCO strong-side defensive end, added to a unit that already included 4-star Utah DT Siaki “Apu” Ika, and 3-star Haynesville (La.) defensive tackle Joseph Evans. Less than two hours after Sopsher announced his choice, Orgeron did land a 25th signee and a fourth defensive lineman when Desmond Little, a 3-star end from Mobile, Ala., signed. Little (6-5, 210) was the No. 56 weak-side defensive end in and had other offers from Alabama, Ole Miss and South Carolina. In addition to seeing Sopsher sign with Alabama, the Tigers also saw two other defensive linemen spurn their overtures to flip as end Byron Young stuck with his commitment to Alabama and Charles Moore chose Louisville. Still, LSU, which added 4-star defensive back Maurice Hampton and 4-star tackle Ray Parker on Wednesday, wound up with 8 of the top 10 players in Louisiana. A class that already included standouts such as 5-star CB/RS Derek Stingley and 5-star running back John Emery wound up including just about everything Orgeron had hoped for. The results weren’t perfect, but they were very close to it. LSU fans aren’t going to make a big deal out of one guy that wanted to be elsewhere. We had a great class and filled all of our holes. LSU plays a 3-4, so we only need one true DT. Hopefully Shelvin is ready to play more this season. Fehoko spent a lot of time there last year until his injury. Ika and Evans were just signed to play there. Jenkins, Cotton, and Livingston were all freshman last year and are DT’s. If one or more develop, we will be rich at that position. We are far from thin there. We just need the coaches to develop what we have. LSU lost 1 DT and added 3 DL. The defense is at least 4-deep at every D-Line position and can move two guys on O-Line back to D-Line if they feel the need to do so. I don’t know where this idea that LSU is thin on D-Line came from. LSU signed a great class and will be a force to be reckoned with. I will admit, I doubted Coach O from the start, but he has changed my perception. Another “I” article…making it about Connor, and not what he is covering. “Grading The LSU Class” or some such, but no. It’s an awesome class, btw. Correction to the name of the writer, but it’s a theme of those who write here in general, to make it about themselves, not the subject. Connor had two in the last three days. Tigers got a fantastic class and should be very happy. They met pretty much all their needs (that’s for you, agdawg, lol) and are in a really good place. 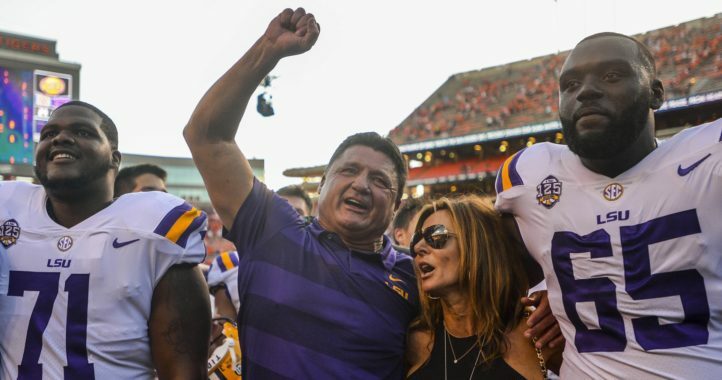 Coach O is doing very, very well. Much respect to them. It’s a very good class. #5 nationally is nothing to complain about. The “but” to that, of course, is that Alabama, Georgia, and A&M all did better. LSU has won at least 8 games every year so far this century. I think it’s the only team to have done that. But we want championships. Alabama has been in the way, and now Georgia is in the way. Soon A&M might be in the way. The goal is 12-0 or 11-1, not 10-2 or 9-3. Those teams did a little better on paper. We won’t know the actual results from this class until the guys get on the field. The SEC West just got a whole lot more interesting. LSU has the potential to make some serious noise this year. Those numbers are nothing more than guess work, as Rivals had Georgia at #1, Alabama at #2 & LSU at #3 in their rankings. Now this is the part that confuses people, it’s not always about where your recruiting class is ranked. As it’s much more about did you fill your needs for a recruiting cycle with quality players, that’s what matters most so than anything else when it comes to recruiting. For example, a team can sign numinous different 4 & 5 star RB’s, WR’s, DB’s & QB’s and end up with a very high ranked recruiting class because of all of those 4 & 5 star RB’s, WR’s, QB’s & DB’s that they signed. Yet they failed miserably at bringing in some quality offensive & defensive linemen, alone with some LB’s. Sometimes those needed position players that you have to have for a recruiting cycle are only ranked as 3 star players or lower. Those players will bring your points average down for that recruiting cycle, but you had to have them to fill holes on your team at positions that were depth depleted. That’s what got Les Miles during his last few seasons at LSU and is one of the main reasons why he got ran off from LSU. Miles has all of those high ranking recruiting classes because of all of the high ranking 4 & 5 star RB’s, WR’s, QB’s & DB’s, while his offensive & defensive line didn’t even have enough players to go 7 on 7 against each other at practice.